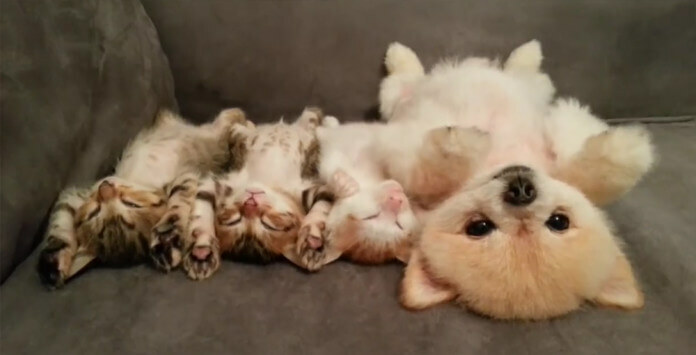 This Puppy Doesn’t Want To Wake The Kittens, So Watch What She Does Instead! Can a dog and a cat be friends? Ever? Yes they can! On our site you’re going to find numerous posts where dogs try to befriend cats and cats steal the show and so on and so forth! Now this post is a little off the edge, I must say. A little thoughtfulness goes a long way. In just about any situation, making the effort to consider and respect someone else’s needs isn’t just polite; it’s a way to demonstrate that you’re a perceptive, caring person. This adorable little pup goes above and beyond at being considerate. She knows that the kittens are resting, and she doesn’t want to disturb them. Just watch the precious solution she comes up with!